I want to do EVERYTHING my brother does. I think I'm five just like him. I also think I'm a boy and that I can do all the crazy things that boys do. Just.like.him ... just like my brother. I love him after all and I want to be just.like.him. No Payton, you cannot do everything your brother does. He is five and he has two years of gross motor skill on you. He is also a boy and well ... boys are a lot more crazy than girls. So please baby ... PLEASE ... stop trying to do everything he does. You can copy him on most things, but let's stop with EVERYTHING. Okay? Mason has this little thing he likes to do here at home. I like to call it skidding out. We have some pretty slick hardwood floors and in his spare time, he likes to take off running and skid out ... as if he is sliding into home plate or something. Somewhere along the way ... instead of looking at him like he is crazy ... Payton decided to join in. So last night they were skidding away, although Payton isn't the most graceful skidder in the world. Bam ... she slid right into the pantry door and busted open her forehead, right in the exact same area that the guitar assaulted her. Except this time we got a 1/2" wide horizontal gash. So after a five hour emergency room visit and some more liquid stitches, we were home and nestled in our bed by 12:30 a.m. This child is quickly following in my footsteps, as I had a few sets of stitches myself as a young child. Then came my arm break and sprained ankles. Ei yi yi ... I hope she starts following someone else's footsteps soon, because I was a disaster of a child. I SWEAR I'm not laughing, ok? Please tell Angela she is NOT a boy! She doesn't have to wear boy clothes, and she doesn't have to wrestle around like a boy. She CAN like dresses, and she CAN like girly things in her hair. Really, she can. As far as the facial injury goes, lots of vitamin E on it will minimize the scarring. Thank Heaven for liquid stitches! Sorry she had such a bad spill. I don't envy you the ER visit. Yikes. Give Payton a hug from us. Oh, now I see what I put my own mother through. 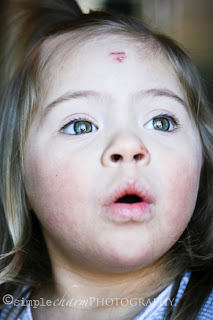 Let's see, I tried to ride my tricycle down the stairs, resulting in road rash from my chin to my forehead (the day before easter). A couple of years later, my parents refused to take my training wheels off, so I "borrowed" the neighbors 10-speed (I was 6 or 7), and tried to ride it up and down our parking area. I hit a gutter and flew over the handlebars, splitting my forehead open (14 stitches?). A passerby found me laying in the street and ran to every house to find who I belonged to. I wanted to be back on the bike the next day. Even at 21 & 24, I had a collision at home plate requiring stitches, a separate ankle break, and was out with friends immediately. OH NO!! poor thing. I too have the clutzy gene, and I'mm hoping none of the kids get it!! Oh, I have one of those kids. Can I recommend keeping some butterflies on hand? That's great they used liquid stitches, much better than the alternative. Oh good grief, Chicky!!! So, when I saw the pic posted on FB, I assumed it was from the LAST time! Ei yi yi is right! LOL poor girl she has bad luck, I am such a clutz I have had stitches in my foorhead twice (the good old fashioned kind lol) and countless other times I injured it that it didnt need stitches lol. One set of stitched were removed way too early and the scar is huge because of it, but at least its right on my hair line. The second healed much better but is smack in the middle of my forehead.. and one tiny no stitch scar from falling down concrete stairs in my walker when I was a baby.. nice right?? Ouch. I see Sophie already headed down the 'copy-everything-Bubba-does' path. Guess I better watch out. She is too cute! Hope she is feeling better after visiting the ER! You can buy liquid stitiches and the butterflies at the local drug store. Gavin gashed his head open last summer. On a saturday night. Out of town. Nope, not hitting the ER in a small town. Thank GOD for LS. It was awsome! But then again, you just never know how "severe" it is so the ER isn't out of the question? Also, remember that heads bleed A LOT!!! Oh my goodness! This girl, she's gonna give you a run for your money! OHHHH Friend of mine! Please check your mail I am sending you bubble wrap for that GIRL!!!! ps: the older she gets the MORE she looks like Kyle to me! Poor little Chicky!! She is a daredevil isn't she? But what a cute one! Give her a kiss for us! LOL, sometimes I'm glad Kayla is so not motor driven! The Hubs was just saying it was so strange that aside from biting her tongue once, Kayla's never hurt herself enough to bleed and has no scars (knock wood!!) and she's almost 5. Poor Payton. What a sweetie!